If you know a student has rather problematic times tables, and/or is not confident working with areas, then this game will help you to assess what the scope and nature of the problem is. Please read the notes about what to say before each round – if you “teach” all the strategies in advance, the game won’t be fun any more! A page of pre-printed tables in the student’s favourite layout. Most will count the first row with their finger. If they do it without a finger, they may get to 9 or 11. If that does happen, I suggest saying “oops, I think you need to check that”. Wait until they have “10”. Do they then count the number of rows next? Or count each square in the next row? Or count down the rows saying 10, 20, 30? Wait until they have 100. This step will tell you what strategy your pupil is comfortable using to find areas. If they counted all the squares from one to 100, then they still need practice doing that, and they will be doing so for the rest of the game. Concentrate on accurate strategies for counting, and celebrating correct answers. Using a pen to “dot” each counted square is usually enough. Confirming that the answers at the end of each row are 10,20,30 will avoid some of the errors. Most students can chant “10,20,30” and will be confident to do so for this task. If they count to 10 then count 10 rows and say “100”, they are demonstating that they are confident with the link between areas, repeated counting, and tables. “Shall I start so you know what to do when it’s your turn?”. (This avoids the need for too many words!). “Throw the dice, and use the 2 numbers to draw a rectangle. I’ve thrown 4 and 5. 4 and a 5 give you a 4×5 rectangle. Your score would be 20 for that, because it has 20 squares inside. That’s the area of the rectangle.” (You’ve explained it without putting them on a back foot by asking them for any of the information. You are only telling them how to play, not how to win. 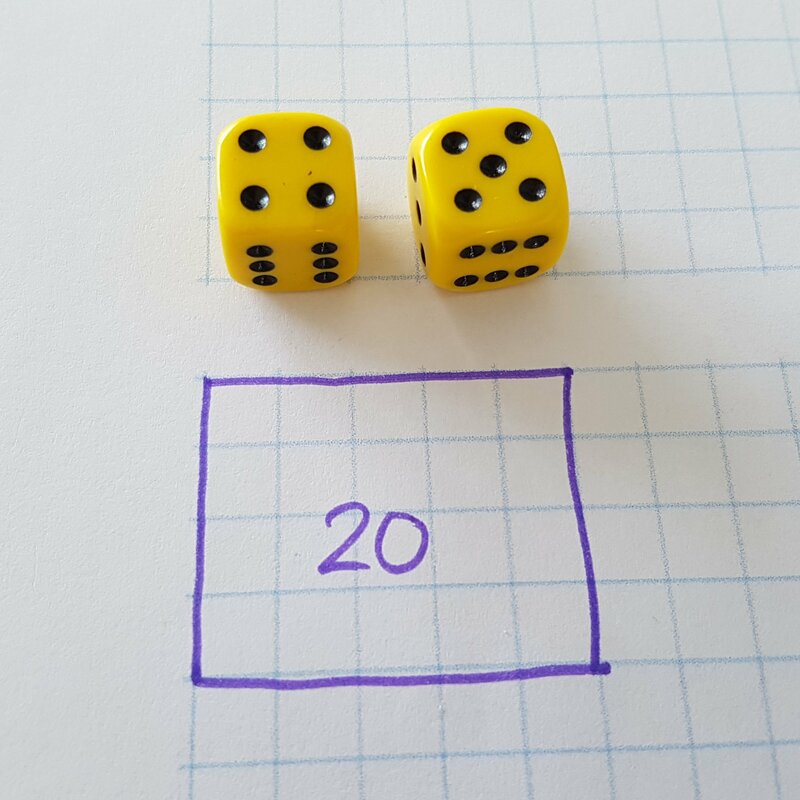 Take turns to throw 2 dice and draw a rectangle. If a dice goes on the floor, say “Oh, it doesn’t count if it goes on the floor. You’ll have to roll it again”. This keeps the game calm! How do they find the areas? Always count? Count correctly? Make mistakes with counting? Sometimes say “5,10,15,20”, sometimes say “5 5s are 25”? This observation is *key* to what they may learn today. Choose the lowest level of skill (if they can’t confidently count, don’t worry about tables!!). You should model at and just above their secure level of skill. They count badly? You use dots. They look up some facts on their chart? You look up all of them to reinforce this is a good strategy. Once one of you has “blocked” most of the board, you will both need to draw 3 lives and each time you have a dice throw you cannot draw, you will lose a life. Once you are dead, the other player continues until they are dead. Once both are dead, total up the scores you each have. As they add their score, notice how they do it? Are they correct? Do they want you to do it? Can they add the numbers silently in their head? Do they want to jot the sum? do they want a calculator? If they struggle and are unhappy, be helpful. Addition can be worked on with a different game on another occasion. Did they sensibly squeeze the rectangles onto the board? Or spread them out and waste space? Are they ready for a “nudge” on strategy, and start being more efficient? Or are they still overwhelmed by the skills needed for this game? If you decide to nudge, give specific advice like “why not draw this one in the corner here, to leave room for big ones later?”. This is simpler than trying to explain in an abstract way. 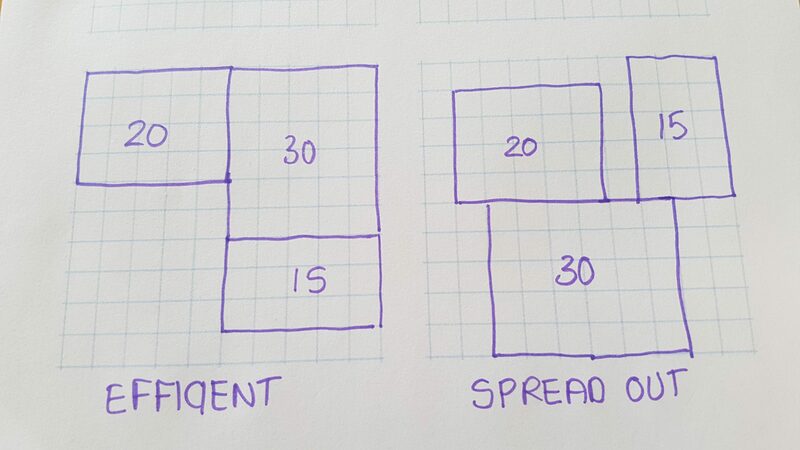 If you decide not to nudge, then aim to lose by spreading your rectangles out. if they make a comment, you can say “I’m trying a different approach this time to see what happens”. Aim for an understanding of some strategies work better than others rather than one being more “right” or “clever” than another. The winner of each round gets a counter. Play best of 5 games. If this whole game is too easy, then draw triangles instead. These may be all right angled or for very advanced version, allow scalene triangles. Discuss areas in either case. Use a ruler! Where can I find good Maths ideas? Cancelling Fractions. A game for 2-4 players. How many rectangles can you see? IGCSE or GCSE Maths for Home Schooled Students? Problem Solving Skills – How much is a tin of tomatoes? Why do children give 10p too much change?